Bull Pasture is part of the Ajo Range within Organ Pipe Cactus National Monument. Before the Monument was established in 1937 this area served as summer cattle pasture for local ranchers. The trail to the Bull Pasture overlook as described here starts at 2330 feet and gains 950 feet in elevation over about 2 miles. An alternate route going by way of the Estes Canyon trail is somewhat longer and steeper. The Bull Pasture trail is mostly moderately steep with some steeper places. Most people will find it moderately strenuous. Geology of the area is the result of explosive volcanic eruptions producing rhyolitic lava flows and pyroclastic welded tuff deposits, followed by extensive block faulting causing uplifting of the layers. These uplifted deposits also form most of the structure of the Sauceda Mountains to the north. Vegetation at the base of the Ajo Mountains is typical of upper elevation moist Arizona Uplands Desert similar to around Tucson. With increasing elevation, this jojoba/brittlebush dominated community grades into a jojoba/evergreen scrubland with some characteristics of desert grassland. Elevation and topography here produce annual precipitation approaching the range of 10 to possibly 12 inches. Such levels support a very lush desert typified by high plant species diversity. WARNING: Collecting animal, plant and mineral specimens is forbidden! Leave no trace and Do Not Collect Mementos! Directions: Take Route 85 South from Ajo, 40 miles, to Organ Pipe Cactus National Monument Visitor's Center. Purchase a permit to enter the Monument. 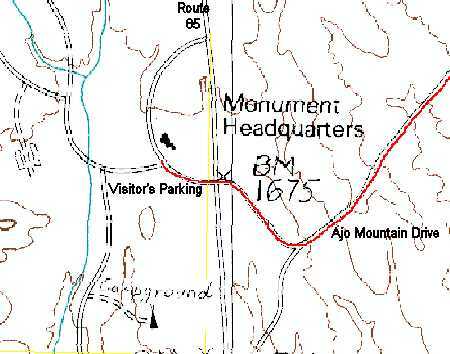 When leaving the visitor's parking lot, cross over Route 85 to enter Ajo Mountain Drive. Marker #15, 11.1 miles from the highway, is Estes Canyon/Bull Pasture trailhead. There are picnic tables and restrooms. Park here and locate the trailheads on the East side of the road. Estes Canyon trail is to the left, Bull Pasture trail is straight ahead. Estes Canyon trail starts off with a gentle grade and ends with a steep assent to join Bull Pasture trail ½ mile from the trail end. 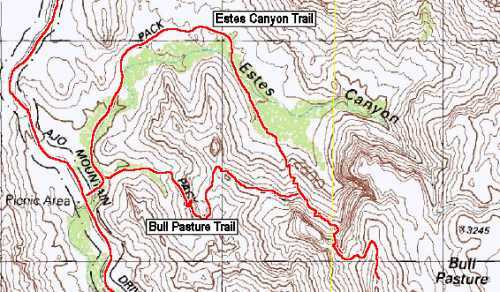 Trailhead to Bull Pasture is 2 miles for Estes Canyon trail and 1½ miles for Bull Pasture trail. The altitude change is 950 feet.